Sam Warren on the windcharger. were away ahead of their time in generating their own electricity. It was built by Sam himself but neither the tower nor windcharger are still there. 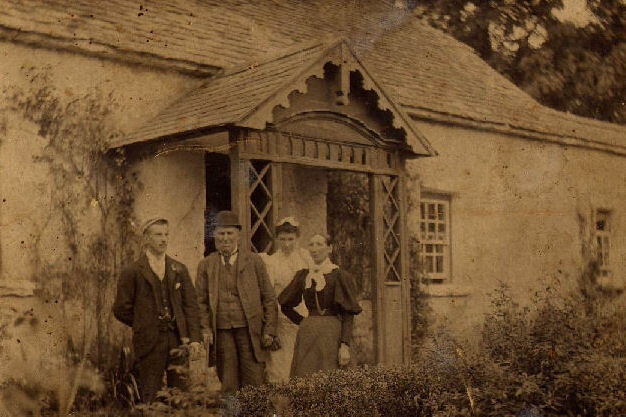 The Warren family of Whitechurch was a very hard working and enterprising family and gave much needed employment to the locals. They were involved in many enterprises especially in the early to mid 1900's. was bought from the Glascott family in Piltown who were landlords of Whitechurch. 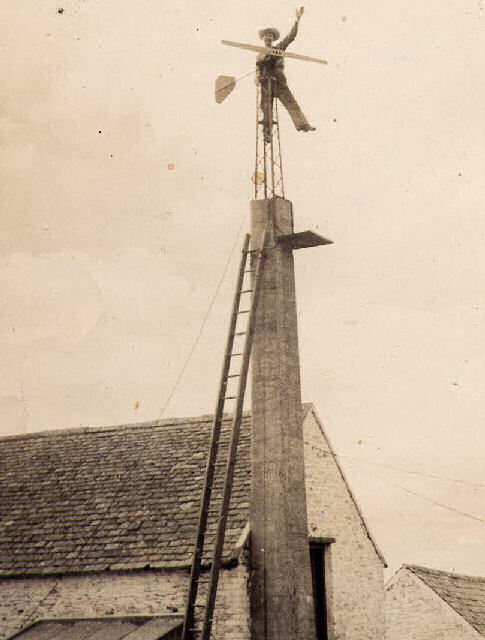 Two workmen and a butcher moved to the Warren Farm and Mary and Katie McDonald began working here also at this time. The pigs were reared, slaughtered, cleaned cut up and prepared to be sold. The bacon was cured in a large vat and then hung from large hooks in the beams of the 'Bacon House'. The bacon was then loaded into their own van and sold to the local houses and shops. minced and mixed with 'rough meal'. which was brought down from Dublin. Spices were then added. The skins for the sausages were made from the intestines of sheep which were collected from the local area on the van run. The puddings were made in a similar way. 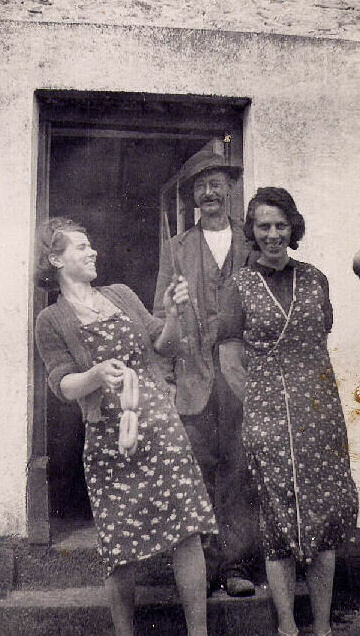 Maggie Dake, Willie Dwyer and Katie McDonald outside the 'Sausage House'. Sam is sitting on the wing of the van which was used in the 30's and 40's. Candles were another product from the pig. These were made from pig fat (tallow) which was poured into moulds with wicks supplied by 'Irish Ropes'. The candles were also sold on the van round. A common problem with the candles was that cats loved the smell and taste of the pig's fat and would often run away with candles. Up to twelve women were involved in the candle making and the sausage business. Sweets were also made here. First of all sugar was boiled until a certain texture was reached. The temperature could be as high as 140 °C. They made boiled sweets,'rock' and 'peggy's leg'. They also imported boiled sweets from Czechoslovakia which were brought in at Dungarvan and collected in the van. The sweets were sold in the van with the meat and candles. 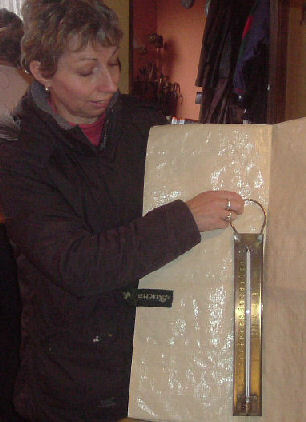 Patricia Knight shows the thermometer used in the making of the boiled sweets. With the coming of World War 2 in 1939 there was a great shortage of tea. Sam Warren and Nellie Doyle were delivering their produce in Taghmon one evening when they stopped for dinner. They were given tea with their meal and then asked for the recipe. Back at Whitechurch they started to experiment that night. The tea was made from carrots minced in the sausage machine which was then put into 44 gallon drums and roasted over a saw-dust fire. The tea was then put into brown bags which were easily found then and were labelled and then sold.. The tea experiment proved a great success. 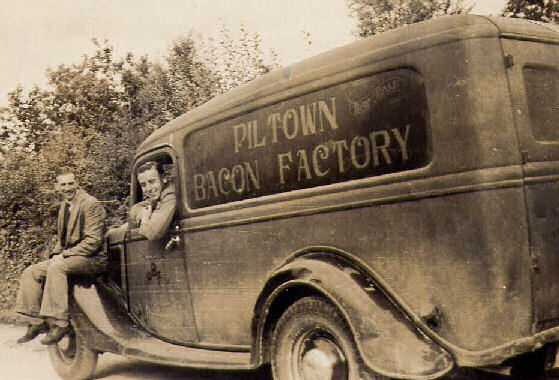 At its peak some 20 people were employed on the farm just for the 'Piltown Bacon Company' work. After the war new laws were brought in regarding slaughter houses and the meat business changed. Pigs were still bred on the farm but the Piltown Bacon Company became a confectionery business with Sam and Nellie working into old age. 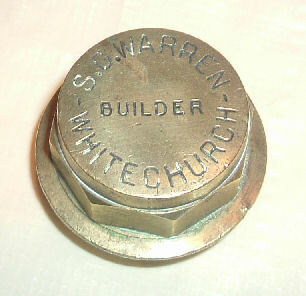 The Warrens were also involved in coach building and making farm trailers. They also had their own forge. Samuel Warren, Wilhemina Warren and Mrs. Dunne in the background. This is the original Warren house in Whitechurch. This is the house today. Roger and Patricia Knight (nee Warren) carry on a thriving self catering business called Warren Farm Guest Cottages. There are five cottages in all to choose from. I wish to thank Patricia Knight most sincerely for allowing me take photos and giving me every assistance. Please note that the house is a private residence.